​​About 600,000 heart attack deaths happen in the US each year, PLUS the hundreds of thousands worldwide. When a heart attack is coming on, following the combined DMSO/MMS1 protocol below, can stop it in its tracks. DMSO has been used in the US since 1955 and there are many testimonies about how it has helped overcome heart attacks. 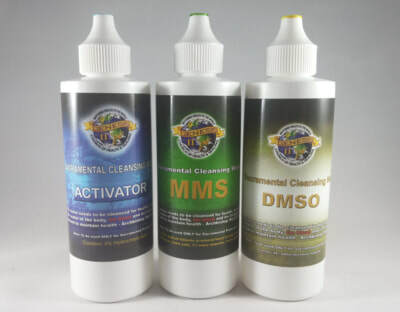 In addition, MMS1 has been used extensively since the year 2000, and DMSO and MMS1 have both been used together for an increased benefit by thousands. "I have been using MMS for 20 years. By the beginning of 2012, I had personally helped over 50,000 people around the world using MMS, (and scores more since that time, but I've lost count). I have only helped three people who were experiencing a heart attack, each case was successful. The advice that I give here is what I would do myself if I was having a heart attack and a hospital was not available to me. If a hospital was available, I would still do this: I would begin the protocol while still at home and I would continue to do it on the way to the hospital, however long it took. When I returned from the hospital, I would continue with the protocol. In my opinion, using DMSO and MMS1 might mean the difference between life and death, or the difference between having long term side effects or not. It is nevertheless completely your responsibility to do or not do this protocol." Signs of a heart attack are pain in the chest, arms, (especially the left), back, neck, jaw, and upper stomach; and shortness of breath, nausea, light headedness, and cold sweats. If one suspects a heart attack coming on, it’s time to start on the protocols, or get the person to the hospital immediately if that is their choice. Check the time so you'll know when the first symptoms appeared. In the case of seeking medical assistance, you can still begin with the first doses of DMSO, followed by MMS1 as per the instructions below. Getting DMSO and MMS1 into the body right away may save a life. And if you do this, the person might be OK by the time you are able to get to the hospital. If the decision is made to go to the hospital, it’s best to always call an ambulance or get someone else to drive. A person should never attempt to drive oneself to a hospital if experiencing a heart attack. Although the instructions below explain what to do at the onset of a heart attack, it is important to know that even though a person has already suffered a heart attack, and it is a few hours to a day or two later, one can still begin and follow through with these instructions starting at day one (see chart on Dosage Guide for Heart Attack Protocol Day 1, page 244). ​There is still hope that damage can be avoided or reversed. If one will go on a regular regimen of taking DMSO along with MMS1, it may reverse part or all of the damage. The instructions below are very detailed. We have included a Dosage Guide Chart at the end of this section to help facilitate one following this protocol. However, please do not cut corners and proceed straight to the chart, thoroughly read all of the instructions below to gain a good understanding of the procedure. At the onset of a heart attack, first off, mix 2 full tablespoons (30 ml) of DMSO diluted in 1/2 cup (4 ounces/120 ml) of water. Drink it down immediately. This is the starting point of the Heart Attack Protocol. Also at the onset of a heart attack, begin Protocol 6 and 6. ​This is two 6-drop doses of activated MMS (MMS1), taken one hour apart. (See page 169 for full details of Protocol 6 and 6.) MMS1 and DMSO work in conjunction with one another, therefore the first 6-drop dose of MMS1 for a heart attack, should be taken in less than two minutes after the first dose of DMSO. The MMS1 must be mixed up in a second 1/2 cup (4 ounces/120 ml) of water. (It should be taken right after the DMSO dose, but do not mix in with the DMSO.) If at any time you miss the two-minute limit, always go ahead and take the dose even if three, five, ten minutes or more have passed. Try not to miss the two-minute limit. Forty-five minutes after the starting point, a fourth 2 tablespoon (30 ml) dose of DMSO in 1/2 cup (4 ounces/120 ml) should be taken. No MMS1 is taken at this time. Also one hour after starting this heart attack protocol, within two minutes time of taking the DMSO dose, take another 6-drop dose of MMS1. This is the second 6-drop dose, taken one hour after the first 6-drop dose. Do not take more than two 6-drop doses of MMS1, one hour a part. Generally I suggest gradually working up to the 3-drop dose when beginning Protocol 1000. Going right to 3 drops an hour for the Heart Protocol, is an exception to the rule. If however, one experiences a Herxheimer reaction and feels nauseated, has diarrhea or vomits, cut the MMS1 dose in half. If necessary, keep reducing it by one half until these symptoms subside. When the symptoms pass, gradually work back up to a 3-drop dose every hour, or to as high a dose that is comfortable to you without causing a Herxheimer reaction. But do not surpass more than 3 drops an hour while on Protocol 1000. Remember, if a person is led to lower the dose of MMS1, they should lower it, but do not quit taking it altogether. We have mentioned here what to do on “day one” at the onset of a heart attack. However, a heart attack can strike at any time, and should one feel a heart attack coming on in the evening, for example, it would be wise to follow the dosing mentioned above, into the night. In other words, stay up or set an alarm if you have to, in order to take your doses, as a heart attack can afflict people in their sleep. The second day after a heart attack, and after one has followed the procedure for day one above, continue taking MMS1, as per Protocol 1000. This is taking a 3-drop dose of MMS1 every hour for eight consecutive hours. I recommend completing the suggested three full weeks of doing Protocol 1000, even if one starts to feel much better, as a precautionary measure. The second day after a heart attack, one can reduce the DMSO intake to 1 tablespoon (15 ml) in the morning and 1 tablespoon (15 ml) in the evening. This amount of DMSO should be taken in 1/4 cup (2 ounces/60 ml) of water. These DMSO dosages should be taken in coordination with the MMS1 dosage. One should be on Protocol 1000, so I suggest they take the DMSO dose within two minutes of the first MMS1 dose of the day, and the last MMS1 dose of the day. ​Drop your intake of DMSO to taking 1 tablespoon (15 ml) of DMSO only 1 time a day (within two minutes of one of your MMS1 doses), for the remaining 21 days. If you feel you are not making progress in your recovery, I recommend going back to day one of the Heart Attack Protocol and starting the whole process over again, as outlined above. In other words, start from the beginning and again continue through until you have completed the 21 days. If one has had a heart attack and has recovered fully, I nevertheless recommend a daily maintenance dose of MMS1 (6-drop dose) and 1 tablespoon (15 ml) of DMSO in 1/4 cup (2 ounces/60ml) of water. If at any time the symptoms of a heart attack come on again, the complete procedure outlined above should be followed. Following are two charts to guide you through this protocol. It is important that you start hour 00:00 immediately when needed and continue with the 15 minute intervals from your starting point (e.g. if a heart attack comes on at 12:20 pm start taking DMSO and MMS1 immediately, then 15 minutes later would be 12:35 pm and so on).